Never get caught in traffic again, thanks to the SUNA Traffic Channel! In-car GPS navigation units are becoming more popular as their price continues to fall. These handy devices provide drivers with turn-by-turn navigation across Australia (and often across the globe), meaning you’ll never have to reach for a street directory again. As well as directing you to and from specific locations, various GPS units may also navigate you to points of interest (POIs), pinpoint your current location in the event of an emergency and synchronise with your mobile phone via Bluetooth connectivity to enable hands-free calling. Although the software behind GPS technology continues to evolve, normal GPS maps don’t take into account traffic conditions when planning a route. To combat this, live traffic updates can inform you of current traffic conditions and recommend routes that bypass or avoid congestion on our roads. Live traffic services have been available across Europe and North America for quite some time, but are still relatively new in Australia. The SUNA Traffic Channel is the first traffic service to launch in Australia and currently the only of its kind. Developed by Intelematics Australia, SUNA broadcasts live traffic information directly to a compatible GPS navigation system. 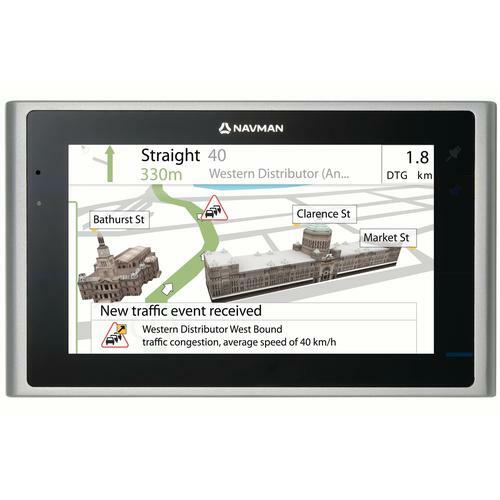 This enables users to be redirected around accidents or general traffic build-up while using their GPS device. SUNA was first launched in Melbourne in 2007 and expanded to Sydney and Brisbane in August 2008. In Sydney, SUNA’s coverage includes the major arterial road network and key motorways across the city. In Brisbane and south-east Queensland, most state controlled roads are covered, but the service will shortly be expanding to cover the Gold Coast. With Melbourne, Sydney and Brisbane drivers now able to use the service, SUNA’s coverage includes more than 75 per cent of Australia’s urban population. The SUNA Traffic Channel is essentially a radio channel that transmits traffic data to a compatible GPS device via an FM transmission — the same way you receive regular FM radio in the car. Armed with this information, your GPS is then able to suggest an alternative route to avoid potential logjams on the road. The transmission technology behind SUNA isn’t new. The radio channel utilises the Radio Data System (RDS) standard to transmit the traffic information to GPS devices every three minutes. SUNA’s data is silently transmitted in a normal FM radio broadcast and will not interfere with your car radio. Unfortunately, the data sent to your GPS by SUNA is encoded, so it can only be received by a SUNA-compatible device. Where does SUNA’s traffic information come from? SUNA relies heavily on the infrastructure already put in place by state traffic authorities. In Sydney, SUNA uses information obtained from the Roads and Traffic Authority (RTA), and it relies on data from VicRoads in Melbourne and Queensland Transport in Brisbane. SUNA particularly focuses on SCATS (Sydney Coordinated Adaptive Traffic System) information. These are vehicle sensors embedded in the road at various traffic light intersections that provide data, particularly concerning traffic flow. SUNA also focuses on data from CCTV systems: camera monitoring systems that watch over major roads. SUNA combines all of this data with information from its own vehicles, which are deployed to known congested areas. Together, all of this information is collated at SUNA’s headquarters and personalised for individual users based on their current location. Messages will vary depending on what GPS device you own, but SUNA provides detailed warnings about incidents and traffic congestions across their coverage areas. Generally the warnings are a combination of warning icons on your map screen and text, though they can also include spoken messages relating to the incident. Most reported traffic incidents through SUNA will include a short description of the incident, its location, the average speed you can expect through the area, and the length of delay expected. Your GPS unit will then be able to present a list of detour options to avoid the area if you wish. In Sydney alone there are typically more than 200 traffic warnings about congestion and incidents every peak hour period. The current SUNA service transmits up to 600 traffic updates each day.